Lewis Hamilton is on his way to tying the record of the legend Juan Manuel Fangio as his win at the Formula 1 Japanese Grand Prix allowed him to extend his lead against Ferrari’s Sebastian Vettel in the driver standings. It’s only a matter of time until he clutches a fifth world championship in the sport. 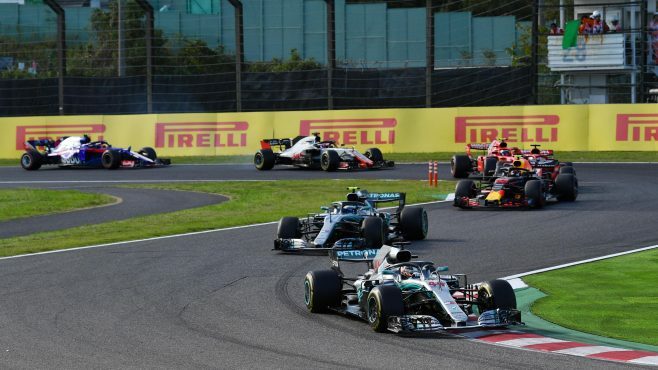 The Japanese GP saw a one-two victory for Mercedes F1 with Hamilton on top while his teammate Valtteri Bottas settled on the second place. The Briton closest rival in the standings, Vettel, was left out at the sixth place during the finish due to an early collision with Red Bull’s Max Verstappen that left him struggling from the 19th position. The race saw the usual faces from the sixth place and up as Red Bull’s Verstappen and Daniel Ricciardo captured the third and fourth places, respectively. Ferrari’s Kimi Raikkonen landed on the fifth place. Currently, Hamilton leads the assault for the 2018 championship with 331 points against Vettel’s 264 points. Meanwhile, the third-placer, Bottas, is only 11 points ahead of Raikkonen with his 207-point score. In terms of Constructor Standings, Mercedes is sitting comfortably on the first rank with 538 points versus Ferrari’s 460 points. Red Bull is way behind the third rank with 319 points. Hamilton only needs one more win with the condition that Vettel finishes lower than second in the next race. Fortunately for the Briton, the next event will be the US Grand Prix in Austin, Texas, which is considered to be his favorite track. Let’s tune in to see how everything will play out in the US two weeks from now.